The Lakers waived second-year guard David Nwaba, a move made both to give themselves more roster and financial flexibility after agreeing to one-year, $18 million deal with free agent guard Kentavious Caldwell-Pope. The Lakers had exercised a $1.3 million team option on June 28 to retain Nwaba, but that contract was non-guaranteed. Any NBA team can sign Nwaba once he clears waivers in the next 48 hours, while the Lakers can sign Caldwell-Pope once Nwaba clears waivers. It’s possible the Lakers could resign Nwaba on a less expensive deal if no other team claims him. The Lakers had strictly made this move out of financial considerations, according to a league source familiar with the team’s thinking. The Lakers had as much as $17 million to spend on a one-year deal, so this move enables them to pay $18 million to Caldwell-Pope. But the move still came at the cost of losing a player the Lakers liked for his defensive hustle. Nwaba had averaged nine points on 57.1 percent shooting and 2.0 assists through three Summer-League appearances. 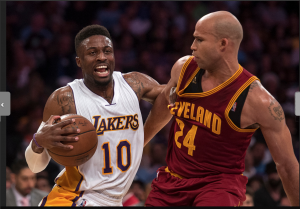 Nwaba, who starred at University High of Los Angeles and Cal Poly San Luis Obispo before going undrafted, impressed the Lakers after calling him up from the D-Fenders for a 10-day contract shortly after negotiating a buyout for veteran guard Jose Calderon following the Feb. 23 trade deadline. The Lakers subsequently signed him to another 10-day deal before signing him to a two-year deal. He averaged 6.0 points on 58 percent shooting and 3.2 rebounds in 19.9 minutes through 20 appearances and two starts. Meanwhile, the Lakers are deliberating on how to fill out the rest of their roster using the “room exception” worth $4.3 million. They have maintained interest in 31-year-old free-agent guard Rajon Rondo and 22-year-old point guard Tyler Ennis, who the Lakers acquired in a mid-season trade from Houston. The Lakers met with Rondo on Tuesday, and have yet to schedule any meeting with Ennis. Nonetheless, the Lakers and Ennis know each other after he averaged a career-high 7.7 points per game on 45.1 percent shooting and 2.4 assists through 22 games. Here’s hoping he clears waivers and he returns post-haste! Nwaba can really be a “heart & soul” type player for the team. How stupid is the Laker F O ??? is David Nwaba still there?